I first stumbled across these feathered ferocities while researching ancient civilizations in South America. Needless to say, I was thoroughly distracted from the cause at hand. The Phorusrhacidae, aptly nick-named the "Terror Birds," were several specials of Giant Carnivorous Birds that once roamed North and South America. Surprisingly, this was millions of years before the giant mammals of the Americas came about. Keywords here: Giant. Carnivorous. 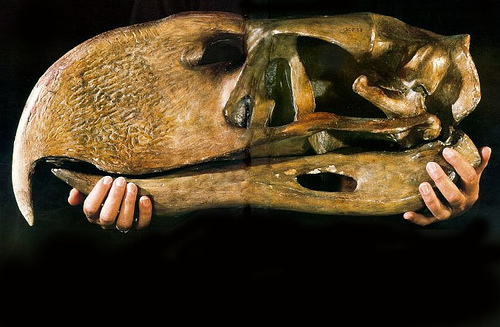 Oh, the bird part is pretty interesting too, since previously the only massive birds I knew of were Madagascar's Elephant Bird and the Moa from New Zealand. And those were okay. Those were herbivores. Just big enough to bite your head off! Photo Credit. I've always read that birds evolved from dinosaurs, velociraptors had feathers, and T-Rex's closest living relative is the chicken, but I'd never quite seen the relation. That is, until I saw the skeleton of Phorsrhacidae! After that, it all makes sense. I mean, seriously. He looks like a velociraptor. 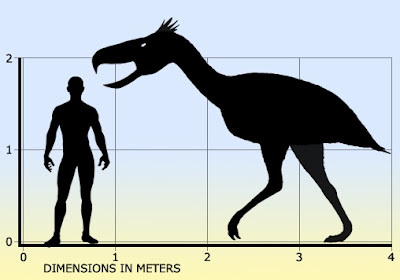 Here, you can see how the skeleton of a Terror Bird compares with its predecessor from the Cretaceous Period. The main difference is that Terror Bird is a Bird, while the Velociraptor was somewhere in the middle of the evolutionary stage between reptiles and birds. Unlike modern reptiles, Velociraptor was warm-blooded, and research suggests that Velociraptors may have been entirely covered in feathers! So, we can see that he was quite far along on his journey to becoming a bird. Again, we can be thankful that neither the Velociraptor nor the Terror Bird could fly! Another difference is that Sir Terror Bird seems to have traded in a mouth full of teeth for a hefty beak that represents about 80% of his skull! Studies show that Terror Birds most likely kicked and pecked their prey to death before tearing them to shreds with that monstrosity of a beak. That skull looks like a helmet to me! Photo Credit. 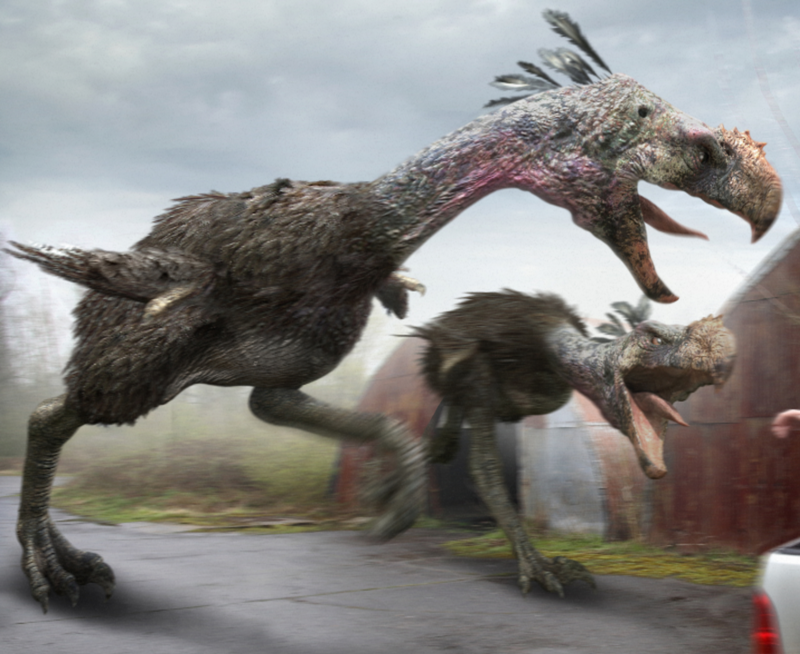 Anyway, this article was pretty much to share the story of the Terror Birds, which frankly, I never knew existed. I was pretty happy with the largest birds being the herbivorous Elephant Birds, but hey, at least now we have something new to haunt our dreams!